Prominent & Leading Manufacturer from Jaipur, we offer gemstone wooden jewellery box, gemstone pine wood boxes 4''x5'', big gemstone pine wood jewellery box and white metal golden meena round box. 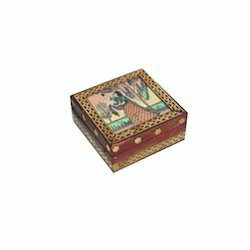 These are Gemstone Wooden Jewellery Box in which you can keep Jewellery, important papers, pins, etc. 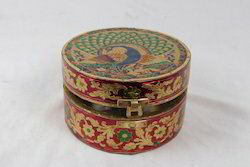 Top of these box is made of gemstone plates. We have boxes in Sheesham (Teak Wood) and in Kadam (White wood). Size: 3"x4", 4"x4", 4"x5", 6"x8", 9"x12"
We are engaged in offering a wide range of Gemstone Boxes. 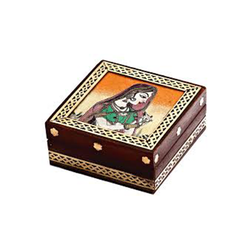 These gemstone boxes are crafted from wood and is decorated gemstone painting. The four different colors of gemstones are placed in between the box which gives this box a unique and different look. The box is made of premium quality Kadambh wood and is also adorned with a fine check border, which adds more beauty at the sides and top of the box. 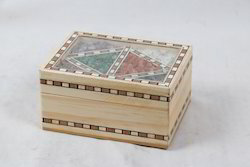 This is pine wood Big Gemstones Jewellery box. it is available in all sizes according to demand of customers. We are a leading Manufacturer and Exporter of White Metal Golden Meena Round Box.This box is used for jewellery and gift articles packaging. Looking for Gemstone Jewellery Boxes ?